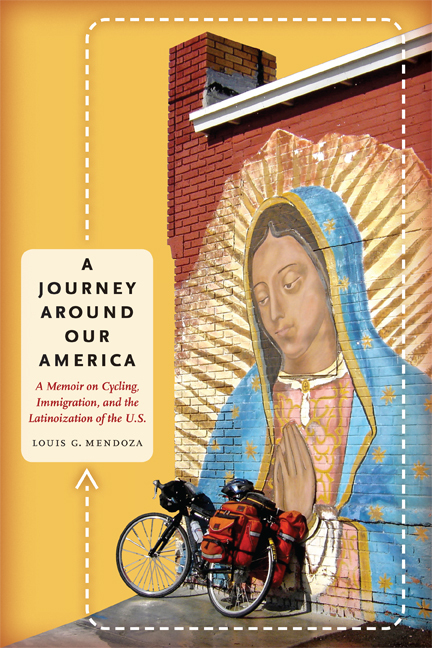 With a discernment of the American character that recalls Alexis de Tocqueville, this riveting account of the author’s 8,500-mile bicycle journey around the United States offers a unique firsthand perspective on how Latino immigrants are changing the face of our country. Immigration and the growing Latino population of the United States have become such contentious issues that it can be hard to have a civil conversation about how Latinoization is changing the face of America. So in the summer of 2007, Louis Mendoza set out to do just that. Starting from Santa Cruz, California, he bicycled 8,500 miles around the entire perimeter of the country, talking to people in large cities and small towns about their experiences either as immigrants or as residents who have welcomed—or not—Latino immigrants into their communities. He presented their enlightening, sometimes surprising, firsthand accounts in Conversations Across Our America: Talking About Immigration and the Latinoization of the United States . Now, in A Journey Around Our America , Mendoza offers his own account of the visceral, emotional, intellectual, and spiritual dimensions of traveling the country in search of a deeper, broader understanding of what it means to be Latino in the United States in the twenty-first century. With a blend of first- and second-person narratives, blog entries, poetry, and excerpts from conversations he had along the way, Mendoza presents his own aspirations for and critique of social relations, political ruminations, personal experiences, and emotional vulnerability alongside the stories of people from all walks of life, including students, activists, manual laborers, and intellectuals. His conversations and his experiences as a Latino on the road reveal the multilayered complexity of Latino life today as no academic study or newspaper report ever could. Part Two: The Start of a Journey: Ready, Set, Go! Louis G. Mendoza is Associate Vice Provost in the Office for Equity and Diversity at the University of Minnesota–Twin Cities, where he is also Chair and Associate Professor in the Department of Chicano Studies. He is coeditor of Crossing Into America: The New Literature of Immigration and author of Historia: The Literary Making of Chicana and Chicano History. Trenches of ideas are worth more than trenches of stone. No doubt this journey will be a huge physical and mental challenge to me. Though I harbor faint memories of being athletic, I can't fool myself about what I need to do to make this trip—about how far I am from being ready and how far I need to go. And yet, in what I hope is not just an exercise of the imagination, I like to think that that my own struggle to realize this journey can be seen as a metaphor for the journey and challenge this nation must undertake to make itself right again. At best, then, it will be a journey of reconciliation between the ideal and the real that is premised on the need to confront certain truths about and limits with our present condition. My hope is that this Journey Around Our America will be not only my story but the story of many whom I encounter who are part of the problem as well as the solution. No doubt my voice will be foregrounded here, but I hope to offer much-needed insight from voices that aren't often heard in formal media venues. It's mid-February and I have to get serious about preparing myself. Part of that is about writing regularly, about preparing to expose myself, my fears, hopes, disappointments, the pain and loneliness I am sure to experience from demons within and with challenges I'm sure to encounter on the road. Even before I start I find comfort in knowing that along the way my spirit, energy, and enthusiasm will be renewed by the energy, hopes, and ideals of people I will meet. Though I'll be traveling alone, I know the road ahead is full of fellow travelers. What can possibly shed new light on the immigration question and the changing demography of the U.S., issues that are both uniting the Latin@ community and making us individual and collective targets of bigots, nativists, and everyday folks who think of all of us as outsiders without regard for facts about when, how, or why we came to be here?1 What information and whose voices are missing from the increasingly hostile debates about immigration and national identity that surround us? How can we interrupt the incessant media hype and sensationalism that pit "us" against "them"? In the season following a series of immigrant-rights marches that rocked the country in the spring and summer of 2006, these questions gnaw at heart and brain. Never before having the luxury of funding to write for an extended opportunity, my first instinct is to think about places where I might retreat from "real-world" distractions to write in seclusion—the typical removal of the self from society that many writers make to facilitate the articulation of experience, analysis, and reflection of internalized feelings, thought, and imagination. As I ponder geographic relocation, perhaps to Mexico or Europe, to write from a distance, distance that would perhaps give me perspective, I admit to myself that this appeals to me because it represents an opportunity for new experience. Heretofore my travels have been limited to, at most, a two- or three-week trip, with two weeks in Cuba in the spring of 1990 providing the starkest contrast to life in the U.S. What I am searching for this time is an extraordinary, if not life-altering, experience. With that in mind I begin thinking of what to write about. Will this be my chance to launch a traditional research project, or will it provide me the opportunity to face my insecurities about writing within a more imaginative framework, to discover once and for all whether I have the skills to render experience through an aesthetic and creative lens. Like many Chican@ scholars, I've always wanted my writing to matter, to be relevant. And so in thinking about the form and substance of a new project, I began to realize the absurdity of removing myself from the cultural and historical context of my work. Let me be clear—place matters to me. Place is intimately related to culture and history; a sense of place is how community manifests in time and space in the actions, words, and feelings of individuals relating to one another and creating a mutual sense of belonging. If I wanted my writing to be relevant, then complete removal of myself from a Chican@ cultural context suddenly seemed like an absurd proposition. Having moved to Minnesota in the summer of 2004, I found myself obliged to think about migration and immigration in new ways. Though I politically came of age in 1986 as an undergraduate in my mid-20s during a wave of immigration-reform fervor, living in Minnesota, a state that is one of the nation's exemplars of the new geography of Latin@ immigration, was eye-opening. My position at the University of Minnesota as chair of the Department of Chicano Studies carried unique expectations and obligations to be a resource of information and facilitator of people's understanding of this emerging population and to be an ally and advocate for immigrant rights. Wanting to get beyond the mostly superficial accounts of media coverage on conflict among newcomers and "citizens,"2 I reached the conclusion that the best way to really explore this problem was to travel across the country and see firsthand the impact of new (im)migrations, to speak personally with folks within and outside the Latin@ community about what their presence here means, to learn lessons from their experiences as a way of broadening and deepening my perspective. And to let the experience of others become part of my own experience as a Chicano in the U.S. My first impulse was to drive across the country, to follow the lead of those before me who had hit the highways and back roads to rediscover America in all its complexity. But as I thought of previous cross-country trips I'd taken, I began to think of all I missed as I sped past places, towns, landscapes, and others in their cars or on foot. Because I'd also hoped to use my sabbatical to get back into an exercise regimen, the idea of traveling by bike struck me as having multiple benefits. Undoubtedly, I'd get in shape, but going by bike would also force me to go slowly, to travel back roads and encounter the natural environment in a new and meaningful way—a way that would give me an appreciation for nature, the climate, the landscape that is an integral part of migrants' experience as they see a new land for the first time and imagine their place within it. The decision to bike across the country added new dimensions to this newly formed research project. To be sure, the sedentary lifestyle of a professor and administrator doesn't lend itself to burning too many calories during the workday, even if I do feel like I'm constantly scrambling to meet deadlines and running all over campus to attend meetings. But as a teen and in my 20s I battled the bulge by becoming a runner. This became a passion for several years, and I participated in a few not-too-well-planned marathons, including the very first Houston-Tenneco Marathon held in the early 1980s. I gave a lot of thought to the benefits of driving. How much easier the trip would be if I could follow my whims to stay or go—or follow leads near or far. How nice it would be to know that I'd always have a roof over my head—even if it was only the roof of my Jeep! And believe me, once the trip began I had many moments of regret about cycling. It was then that I had to remind myself that I was riding the bike for numerous reasons—some more symbolic and metaphorical than practical, though there was a practical element to it. Riding a bike required me to move slowly—to appreciate the journey's difficulty, not because I'm a masochist but because I thought I would see more by seeing less. What I mean by this is that my experience traveling by bike was fundamentally different than the experience I would have had by car. We are a car culture and I am a product of that. Its insular nature can bring us together by allowing us to cover great distances at a fast pace, but it can also keep us apart from each other as we travel in this metal cocoon with all our creature comforts protecting us from the elements and, in some ways, from each other. Riding down the back roads and through towns and cities on a bicycle, I would experience nature and the road and people, as well as architecture and infrastructure, entirely differently. Cycling forced me to have a different kind of interaction with the world. It wasn't always better, but that may well be the point. The journey was difficult, but each day I gained better appreciation for the world around me—be it the power of the sun or the wind or the limits of my own body. Each day I encountered people in ways that I would not have if I had been in a car. When I needed to reach out for help, especially during these times, I experienced goodness and trust and had opportunities to interact with people that I wouldn't have had otherwise. Cycling inspired interaction with people I otherwise would not have had because it earned me instant respect from them. They wanted to know what I experienced, to share what knowledge they could of this or that town, of their own cycling experiences, or what was up the road, and to wish me luck on my journey. I found in these small acts of kindness a form of human solidarity—a gesture of giving me something they perceived I needed that would benefit us both—a gesture of mutuality. When these conversations had a chance to go further and I had an opportunity to tell them what I do for a living and what I was researching and hoped to write, people were always intrigued. At a personal level, I wanted the physical and mental challenge of doing this—to make me stronger, more fit and capable of countering the many challenges this nation, this world, face—not because I expect to single-handedly offer solutions but because I believe that the better we are each individually prepared, the better we are all prepared for the battles that lie ahead. I found my ability to be empathetic with immigrants enhanced by the trip. When I was dog tired and wanted to make this trip easier for myself, I thought of the many people who continue to travel across nations and borders by foot in search of food, job, a better life for themselves and their children, and I knew I had no room to complain because I had the luxury to take such a trip as this. I also began to see getting myself in shape as a metaphor for the hard work this country needs to do to get itself right. We have become not only heavier but lazier as whole generations have moved away from the physically laborious work of our ancestors. I'm talking across cultures here—we have forgotten that there are lots of folks who still do the manual labor of the fields, the services we take for granted, our dirty work. Our dependence on basic sustenance and the comfort we experience from this invisible labor force is an integral part of our social body, but like so many vital organs of our physical bodies, we fail to appreciate the necessity of it until problems occur. What will it take to get people to truly appreciate the role everyone plays in making the success and well-being of this nation possible? There is no easy answer. But what I learned from people, particularly people in small towns, is that they are acutely aware that the livelihoods of their towns depend on an influx of new people. Over and over again I heard from people that these small towns would die if not for the immigrants working in their factories, fields, mills, mines, and dairies. Ironically, it's the new immigrants who make it possible for some of the elderly of the towns to continue to hold onto their quaint lives—even as many elderly Euro-Americans have to adjust to the existence of Spanish-language newspapers and radio, Mexican restaurants and tienditas, and Spanish in the schools and on the soccer fields. No doubt some resistance, resentment, and suspicion exist, but I think many, if not most, see that the future is about change. The violence and pain accompanying the birth of a new era cannot be overlooked or taken lightly, but resistance to change does not forestall it. Finally, another reason I felt it was important to do this despite concerns about my safety and vulnerability was that I wanted to exercise my right to do this. A great number of people, including strangers, expressed concern for my safety when they discovered I was traveling alone. I didn't see this as a test of masculinity or bravado, though I was always aware that being a man made me somewhat less vulnerable than a woman would be, even as I was simultaneously aware that I was also being perceived as a man of color. But I kept asking myself, "If other people take these trips, why not I?" After giving considerable thought to the risks, I found it important to do this as an act of affirmation, to claim what we should all be able to claim—the right to go where we want, when we want, how we want. Having decided to do this didn't mean I could do so carefree. No, I knew a big part of doing this required that I act responsibly in what I said and how I carried myself. But I also knew that one cannot live life afraid of the worst possible people or accidents that can happen. To be free means to live in a world where we can all make choices that will allow us to grow and be a force in the world, even when that entails taking risks. In my own small way, in moving across the country at this time I was trying to both be changed and be an agent of change, to educate and be educated, to show others that we have much to learn from each other, to affirm firsthand what I already knew to be true—that people struggle through anger and injustice and constant pain to make this a better place and that this is a collective project in which we need to see ourselves mutually invested. These sentiments were confirmed for me by a number of people who expressed that that they felt I was doing this for all of "us." In thinking of literary antecedents for my journey, that is, travels across or around the United States to explore or rediscover what makes the U.S. unique, some obvious models come to mind, among them Alexander Tocqueville's Democracy in America (1835), John Steinbeck's Travels with Charley (1961), Peter Jenkins' Travels with Charley (1979), William Least Heat-Moon's Blue Highways (1982), and Jon Krakauer's Into the Wild (1996). There is, of course, a plethora of literature produced about the immigrant's journey to the U.S. and migration literature that chronicles the westward expansion of Euro-Americans across the continent. There is also a genre of travel literature from early colonizers that chronicles "discovery," conquest of the indigenous peoples, and the expansion of territorial acquisition for the crown or nation-state. We have chronicles by conquistadores and much more recent accounts by Latin@ immigrants, but very little literature by Latin@s exists about the deliberate movement across the land for the purpose of reflection and exploration not associated with conquest. Some recent important contributions that document the Latin@ (im)migrant experience are Ramon "Tianguis" Perez' Diary of an Undocumented Immigrant (1991), Ruben Martinez' Crossing Over (2004), and Sonia Narzio's Enrique's Journey (2006). Each of these is clearly articulated from a Latin@ perspective and details the harsh realities confronted by the decision to leave home, the journey, and the reception by the respective new host community. These and the many invaluable collections of immigrant narratives documenting the crossing-over experiences of migrants in Arizona or the emergence of a sizable population of Latin@s in the northeastern or southern U.S. offer important insights into the experience of migrants. What I found different in my journey is not only my mode of travel but the geographic diversity of the destinations of new immigrants and the range of historical experience covered by including conversations with Latin@s from many different national backgrounds who have been in the U.S. for multiple generations. In the volume Conversations Across Our America: Talking About Immigration and Latinoization in the U.S. (University of Texas Press, 2012), I share with readers segments of interviews I conducted with numerous people on this trip. In contrast, this companion volume is intended as a travel memoir, a firsthand account of my experience in which I share the visceral, emotional, intellectual, and spiritual dimensions of traveling the country in search of a deeper, broader understanding of what it means to be Latin@ in the U.S. in the twenty-first century. To be sure, there is an emphasis on the issue of immigration as it shapes so much of the discourse on Latin@s these days, but that is not the exclusive focus. Even as I foreground my perspective, one of the challenges I face in writing this memoir is how to do justice to the voices of people I spoke with on my journey—those I encountered on the road, in stores, cafes and those who so generously allowed me to record audio and/or video of lengthier interviews with them. As the reader will see, I include voices that complement and only minimally overlap those in Conversations Across Our America. As a memoir, the present book invites readers to appreciate the trip as a journey across the land by bicycle in a particular time and place—to see the interacting and mutually informing dynamics of the social, political, and natural climate that made up the summer and fall of 2007 as I traveled clockwise around the perimeter of the country. While I acknowledge meeting many of the people whose interviews are in Conversations, I include here segments of interviews with others that were not included in that book. More importantly, Journey allows me to discuss the multitude of people, places, and experiences that made this trip truly exceptional. In addition to reading memoirs of other trips across the country during my trip, I read local and national newspapers on a daily basis to keep apprised of immigration issues as they arose during this time. I often found strong resonance between the two, but there were many instances in which local coverage of events was dissonant with what was occurring nationally or not in line with the conversations I had with community members. In an effort to reconcile my interest in conveying the trip qua trip, one that was constantly informed by my experiences on the road and my consumption of local and national print media with the issues and themes that arose from my conversation with local informants, I have utilized a dual organizing principle to structure the book. First, the narrative of my trip that follows is organized chronologically, covering some of my pre-trip preparations in spring 2007 and then in more detail from July 1, when I departed Santa Cruz, California, to December 19, when I completed my more than 5,000-mile journey in Oakland, California. Like most travel memoirs, this book is organized linearly—the narrative by and large reflects the chronological and geographical structure of my trip. In part 1 I describe my preparations for the journey. Part 2 focuses on the segment of my travels from northern California back to Minneapolis, Minnesota, where I rested for ten days. Part 3 covers the ride from the Midwest to the East Coast and the South through Louisiana. Finally, Part 4 covers my journey in the Southwest through the borderland states and back to northern California. I have added a few segments of transcripts from my conversations with people in order to be inclusive of multiple voices. For similar reasons, select excerpts from local and national newspaper articles are inserted as sidebars to provide more context for the discourse on immigration during the trip. Finally, a word about the book's title. While I hope that by now I have made my motivations and the literary antecedents for this trip clear, the title, A Journey Around Our America , was inspired by a provocative 1891 essay written by the famous Cuban poet, essayist, intellectual, and patriot José Martí for New York City's La Revista Ilustrada .3 In this rhetorically charged essay Martí offers his readers a continental vision of the Americas that is set over and against the U.S.'s arrogant appropriation of the continental identifier. He thus speaks of two distinctively different Americas, that which is ours (Latin America) and that which is not (the United States). He argues against a stifling parochialism that pits communities against one another and is politically counterproductive in the context of continental inequities and dangers posed by U.S. imperialism. To govern well, one must attend closely to the reality of the place that is governed. In America, the good ruler does not need to know how the German or Frenchman is governed, but what elements his own country is composed of and how he can marshal them so as to reach, by means and institutions born from the country itself, the desirable state in which every man knows himself and is active, and all men enjoy the abundance that Nature, for the good of all, has bestowed on the country they make fruitful by their labor and defend with their lives. The government must be born from the country. The spirit of the government must be the spirit of the country. The form of the government must be in harmony with the country's natural constitution. The government is no more than equilibrium among the country's natural elements. To know the country and govern it in accordance with that knowledge is the only way of freeing it from tyranny. The European university must yield to the American university. The history of America from the Incas to the present must be taught in its smallest detail, even if the Greek Archons go untaught. Our own Greece is preferable to the Greece that is not ours; we need it more. Statesmen who arise from the nation must replace statesmen who are alien to it. Let the world be grafted onto our republics, but we must be the trunk. The disdain of the formidable neighbor who does not know her is our America's greatest danger, and it is urgent—for the day of the visit is near—that her neighbor come to know her, and quickly, so that he will not disdain her. . . . One must have faith in the best in man and distrust the worst. One must give the best every opportunity, so that the worst will be laid bare and overcome. If not, the worst will prevail. Nations should have one special pillory for those who incite them to futile hatreds, and another for those who do not tell them the truth until it is too late. There is no racial hatred, because there are no races. . . . The soul, equal and eternal, emanates from bodies that are diverse in form and color. Anyone who promotes and disseminates opposition or hatred among races is committing a sin against humanity. While his rhetoric and gendered use of language is anachronistic, in many respects Martí was ahead of his time in his rejection of scientific racism and in his call for transnational harmony, not under the banner of a single nation-state but through a well-informed citizenry. His reminder that "our own Greece is preferable to the Greece that is not ours; we need it more" along with his admonition for "one special pillory for those who incite them to futile hatreds, and another for those who do not tell them the truth until it is too late" could well apply to contemporary discourse on immigration as it emanates from Arizona in its passage in 2010 of state SB1070 and HB2162 imposing anti-immigrant restrictions explicitly intended to rid the state of undocumented immigrants and eliminating ethnic studies, respectively. As you embark on this literary journey with me, I hope you will explore and discover, as I did, a different face of America than is represented by those who would sow hatred and discord even as they conveniently forget that European immigrants seized and occupied native lands and evaluate human worth, indeed life itself, by legal categories. Traveling is a brutality. It forces you to trust strangers and to lose sight of all that familiar comfort of home and friends. You are constantly off balance. Nothing is yours except the essential things—air, sleep, dreams, the sea, the sky—all things tending towards the eternal or what we imagine of it. ¿Bicicleta Bato? I didn't even own a bike when I decided to take this trip! I can't say that I've had a lifelong relationship with bikes. In a family of eight children, it's not like we each had our own. The bikes we had tended to be communal and generational as they made their way down the entire sibling chain. I remember we younger ones had a tricycle or two we shared, my two older sisters had big blue bikes, one of which my brother and I would later use for paper routes, and I remember the bright orange Stingray bike my brother earned when he was in high school selling flower seeds or some such item door to door. He was always good about setting a goal for some prize or another through his salesmanship. I recall the nice eight-track stereo he got a year or two after that. Of course, I was strictly prohibited from riding the prized Stingray with its chopper-style forks on the front wheel that simulated a motorcycle look. Naturally, this prohibition didn't stop me from taking it around the block when I knew I could do so before he came home. And naturally, doing so led to disaster one day when I came barreling down the sidewalk, hopping the street curb at the end of one block, and bouncing onto the street at the corner of Lyons and Majestic—which was so cool because this bike had front shock absorbers, too—and ran full speed ahead into the side of a car that had pulled right into my path. I flew off the bike and landed on the hood of the car with a big thump that made a dent, and then I rolled off the other side. I didn't have the luxury of thinking about the cuts and bruises from the accident. I saw trouble from two directions—the driver because of the dent on his car and the damage that was done to the Stingray, whose long front-wheel forks now seemed to have the elbows of a cricket. The driver was both mad and afraid as he hopped out and began yelling at me. For a moment I thought he might hit me, so I asked if he wanted me to go get the cop whose car was parked at the Dixie Maid Malt Shop across the street. When I said this I think we both assessed the situation and decided we'd better cut our losses. I was worried that my parents might have to end up paying for his car. He probably realized that he might be liable for not approaching the intersection with more care. So he said something to the effect that I should be more careful, and he took off. With him gone I began to let the next level of fear sink in as I saw how badly damaged the forks, the wheel, and the handlebars were. In true Mendoza-kid fashion, I took that bike home and tried my best to twist it back into shape in the hopes that I would never have to tell my brother that his new bike had, uh, been really broken in that afternoon. It didn't work, of course, and it was one of those evenings when you're glad you have parents there to keep fraternal violence from getting out of hand. This incident may have had something to do with me partnering up for a while with a cousin of Raymond Nava, my next-door neighbor, who ran a sort of chop shop for bikes out of Raymond's garage. I didn't steal any bikes, but I did learn how to disassemble, reassemble, and paint them in various configurations. Like so many bikensteins, each went on to live another life in a new and improved form. I can only recall owning two other bikes since that time, the first a ten-speed in my mid-20s that I would ride to my parents' house on Sunday afternoons—a good 20 miles each way. But going across town on Houston streets really requires an off-road bike, and I gave it up after a while because of numerous flats I'd pick up going over railroad tracks and pothole-riddled streets. I mail-ordered a pretty cool road bike in 2002 that I used to go on long rides on the paved mission trails in south San Antonio, alone or with a university colleague. When I moved away, I left it behind with him to give to his granddaughter. Having decided I was going to make this journey on two wheels, in October 2006 I went to Erik's Bike Shop in Minneapolis to purchase the bike that would carry me across the country. Thus began my immersion into cycling culture as I learned about touring bikes, cycling apparel, and a myriad of bike accessories such as mirrors, a bike computer, lights, panniers, pedals with shoe clips, shoes with pedal clips, and so on. I left with a beautiful, black, very light, Cannondale touring bike and a new awareness of just how bourgeois a sport cycling can be. As I was to learn over and over again, most bike-store employees are avid cyclists, and short of embarking on their own excursions, nothing is more exciting to them than to hear about a cycling adventure. Their enthusiasm is contagious, and without exception, every time I needed help on my trip, the mechanics at bike shops dropped what they were doing to attend to my needs so I could get back on the road as soon as possible. It wasn't long before the harsh Minnesota winter bore down, and being the still-novice cyclist that I was, I confined myself to cycling on a trainer rather than braving the winter winds and ice- and snow-covered streets. To say that winter in Minnesota is long is an understatement. To help give myself variety in my training I bought an elliptical trainer and set it up alongside the bike in the basement. Though I did use them, I have to admit it was only sporadically, as I found the basement workout boring and dreary. In mid-February I also began slowly preparing myself for the trip by launching a blog on which I hoped to document my motivation, preparation, goals, and eventually the trip itself. The heavy snows of winter gave me lots of time to ponder the issues, and I began to more closely scrutinize local and national media coverage of immigrants and the politics and punditry surrounding immigration discussions in this country. Most Latin@s in this country know the experience of being perceived as an outsider. Much of this has to do with the perception of all of us as nonnatives, recent immigrants, and people from elsewhere who don't have a legitimate claim for social and political inclusion. Most often these assumptions are without regard for our actual personal or collective histories. And they are just plain wrong. Little distinction is made among the histories of various Latin@ groups, and little historical knowledge is transferred through the educational system, and thus the ignorance is institutionally perpetuated. For many Latin@s, our relationship to our immigrant heritage is unique and complex. And the lack of educational access, equity, and inclusion simply don't help, as Latin@s' self-awareness suffers first in how little many of us even know about our history or our own families' histories. Unfortunately, contradictions like this are integral to the very foundation of this country. It's hard to call a place a true home if one cannot feel safe and respected. Of course, we can demand it and we must continue to do so, but doing so causes a restless psyche, a sense of both arriving and yet still having a long way to go. This is not something that only people of Mexican descent feel. It's shared by many immigrants. It's felt even more strongly by those who were here long before the so-called founders of this country. A few decades back, Chican@s saw in the label "Mexican-American" a sign of our second-class status in society. To be seen and respected as citizens we had to emphasize both our heritage and our legal status. Well, Chican@s may no longer be hyphenated Americans, but by almost any measure our community still doesn't enjoy social, economic, or political equality. For those who think about this and feel the continual dis-ease of not fully belonging, we feel a need to qualify our status with quotation marks to signify our awareness of this condition. We're "American," or as some would say, americano, to signify linguistically a broader sense of identity that is not fully aligned with official nationalism. We're stuck between the quotation marks; we're enmeshed in ambiguity, in suspended meaning. Sounds like we're in the same old place, no? But we have to try to make change by being active agents of change and of resistance against cultural obliteration. I try to do my part in the struggle "out there," the so-called real world of action and decisions where people's life chances are made and unmade. I also try to be honest about my limitations—about what I can and cannot do. For the past few years, the Minnesota Immigrant Freedom Network has sponsored a day at the state capitol to advocate for passage of the Minnesota DREAM Act, a state version of the Federal Development, Relief, and Education for Alien Minors legislative proposal that immigrant-rights advocates support. Successful passage at the federal level would enable states to charge in-state tuition for undocumented youth to attend higher education if they meet certain qualifying residency provisions. The federal version contains provisions for obtaining permanent residency and the possibility of citizenship contingent on receiving a college education or serving in the military. Eleven states have passed a version of this bill, though they do not have the ability to establish a pathway to citizenship for beneficiaries. The rally at the capitol is a day of affirmation in many respects. School youths express poignant testimonios, chant political slogans, and meet with legislators to try to convince them that recent immigrants have a dream of attending college one day. These youths embody not only democracy but what is best about this country. They are the latent potential and talent of our communities who are in the U.S. with their families often because U.S. military, policy makers, and corporations were there—in the not too distant past in their homelands—systematically changing their economies, the political and social structures of their societies, even their cultures. Through no fault of their own, these youths have become a blank canvas upon which some of the worst elements of this country get projected. They want nothing more than to be like "us," and "we" hate them for it. There's some kind of self-loathing going on. Yes, "Americans" give mixed messages: "We want and need you to sustain our comfortable lifestyle by picking our food and working our factories and building our houses and serving our meals, but we don't want you to be our neighbors or utilize social services or have the right to be healthy or eat well or have insurance or, 'god forbid,' have the audacity to demand an education!" My life has been a constant search for connection—between myself and others, between my inner and outer worlds, between my fears and hopes. I want to feel whole and loved. I want a place to call home that feels safe and secure, a place where I am wanted. Is that such an odd desire? In March I realize that my training and preparation have not gone as well as I'd intended. Too many distractions with work and a lack of discipline on my part have made finding the time and ganas to bike ride and to write difficult. I am still very psyched about doing this. I want and need to get away from the daily grind, so despite increasing concern about my lack of preparation, I remain intent on heading out July 1, the day my sabbatical begins. There are so many aspects of this trip to prepare for that I sometimes feel overwhelmed. As I go through my personal things in preparation for this trip, I come across the earliest photo I have of me and a bike. I'm the little kid in a baseball cap squeezing in on my brother, Bob, who's on the bike. This is years before the infamous orange Stingray. It must be around 1964. I can't figure out where we are, but I assume it must be early spring since it can't possibly be summer in Houston if we're wearing coats and sweaters. We all look pretty happy here—though we're lined up, it's not the whole clan like photos taken during holidays. In March I attend a conference in San Jose, California, and at the airport I pick up an interesting book by Terri Jentz titled A Strange Piece of Paradise . I am first attracted by the picture, but once I read the book jacket I am hooked and spend as much time as I can over the next three days reading it. It's the story of Jentz and another young woman who in the summer of 1977, following their sophomore year at Yale, decided to take a cross-country bike ride. Just a few days into their ride they experienced a horrifically violent attack as they camped near Bend, Oregon. It's an amazingly courageous book. While their story has to be understood in the national context of rampant and random violence against women during that time, the violence isn't exactly something this country has outgrown. Can you say Don Imus? Jentz and her friend were only six days into their cross-country bike journey when they were run over by truck-driving misogynist as they lay sleeping in their tent, and the author's journey—her life path—was altered forever. The lessons one can take from her are many—courage, tenacity, perseverance, spiritual strength, how to channel anger and action into a creative force—and the book is also a cautionary tale about the fragility of life in both large and small ways. Reading the book makes clear to me that I'll have to think of issues of safety on the road, how I'm perceived by strangers as a curiosity, a threat, an opportunity, vulnerable. How do I account for unforeseen possibilities? These were already on my mind before picking up the book, but this has reminded me how much I need to both anticipate (control) and to let go (of the illusion of control) even before I get on the road. Which brings me to another point. I have decided to change my route so that rather than travel only areas of new immigration, I will travel the entire perimeter of the country. This will give me the opportunity to go through Cline Falls, Oregon, where the events documented in A Strange Piece of Paradise occurred. I don't think I'm being morbid in doing this—it's curiosity, yes, but it's a tribute to the journey those two young women were never able to complete. This will add some miles to my proposed route, but the more I read of other people's journeys, I don't think I'll have a problem finishing this expanded route in my six-month time frame. I may start out slowly, but I think I'll be able to pick up speed and stamina as I go along. (I'd better!) My plan is to cross into Canada and Mexico at points along the way so I can add an international dimension to the trip. I'll begin the trip in Santa Cruz because my goal is to travel the northern route in the summer so I don't have to confront the Midwestern winter as I conclude the trip. What is left out is travel down through the middle of the country, though I still go through many states in the upper Midwest. Two relevant news stories today. One is about a foiled plot by militiamen to attack Mexican migrant workers in Alabama with homemade bombs, assault rifles, and assorted other firearms. The other is an editorial commentary by a local Mexican American businessman in Minneapolis who poignantly expresses how painful and tragic it is to live as a target of conservative zealots who are trying to score political points by passing legislation that marginalizes all Latin@s in this country. The former provides support for the latter's claim that we are indeed random targets, that we are all perceived as illegal, that once someone is cast as illegal, the way is paved for random and deliberate acts of violence to occur. It's not so illogical as it might seem—after all, the fantasy that we are a people that lives by the rule of law and that laws somehow serve as the basis for a just, fair, and humane nation are so powerful a myth that many become blind to legal injustices that pervade our society. Criminalizing people and legitimating the language of criminalization—that a human being can be illegal rather than merely commit illegal acts—is the same language that justified the atrocities of Nazi Germany. Anger and sadness, those are the daily psychological and emotional boundaries that define many people's lives. It can be hard not to lapse into despair or do like so many others do and simply exercise whatever privilege we may have to make sure people know we are not one of los ilegales. One would think that being a cynic protects one from being surprised by the everyday nature of random and deliberate violence, be it in Alabama or by police against people at the May 1 pro-immigrant rally in L.A., where clearly the Latin@ media became legitimate targets of the police. I was shocked, however, that the foiled attack in Alabama did not make national news as an act of terrorism. Why do you suppose this was so? Could it be because the target was a bunch of brown folks who were presumably "illegal"? Does that somehow lessen the severity of this intended crime? Imagine, if you will, that the foiled attack had been planned by brown men (of any ethnicity) against a community of whites? What do you suppose the news coverage would have been like in that case? I can only imagine the national headlines framing this as an act of terrorism occurring right here on American soil—warning us to be on the lookout for suspicious groups gathering to plot against national safety. Oh, before I forget, happy Cinco de Mayo! Toward the end of the spring semester my work schedule begins lightening up to the point that I can devote more time to prepare. Of course, I should be able to integrate exercise into my daily life, but finding balance is not a forte of mine. I did commit to a 100-mile ride in Chippewa Falls, Wisconsin, on May 28, so that's a nice short-term goal. And if you're thinking I'm crazy to think I can do that, I might just surprise both of us. I went on a 65-mile ride this past Saturday and felt pretty good. If I can build up my time and stamina, I'll be just fine. It was a wonderful ride out past the town of Excelsior to the Chanhassen nature reserve. I have to say that though I didn't map out the ride in advance, Minnesota has such nice trails that I was able to get on Cedar Lake Trail and just keep on going west. A few weeks back when it was still cold I went the same route but not nearly as far. I was pleased to see that I got to the point where I turned around last time in a half-hour less. I attribute that to being a little stronger but also because the weather is so much nicer. Last time there was still snow and ice on the ground, and I experienced a full-speed fall when I hit an ice patch. Besides a few scrapes and a bruised ego, I was fine. It also helped this time that I have since outfitted my bike with a few more gadgets, like a computer that tells me my pace and distance. It's very useful in motivating me to keep a steady pace. I find that it doesn't take a lot more effort to pick up my speed when I need to. Long, steady inclines up hills are hard, as one would expect. I hit a big bump coming down a decline and stopped to inspect the bike and could not get going up the hill, so I had to walk. That was humbling. Going down one hill I almost hit 40 miles per hour and had a flashback of a time in high school when my cousin Paul and I stayed out at his parents' beach home in a small town near Galveston and rode to the island. On the way there we rode over the drawbridge after the bridgeman chastised us for going that route, but he let the bridge down for us anyway. To avoid his attitude on the way back at the end of the day, we rode over the steep bridge connecting the island to the mainland via I-45. It was a pretty foolish thing to do, though we didn't realize how much so until we made it safely back to the other side. There was no bike lane or sidewalk, so we crept along the right-hand lane as cars going 55 mph passed us. Riding behind Paul, all I could think was that if he fell, that was it for both of us—we would spin out into the traffic and get crushed. When we got to the other side, we were pretty freaked out about what we had just done and swore we wouldn't tell our parents because we would be justifiably chastised by them. It was thrilling and frightening. I expect a lot of that on this trip. Being in the nature reserve was quite beautiful as deer ambled across the bike path without fear of me. To be sure, the ride back home was long and hard, and I just wanted to be done. I also realized how much energy I burned and became aware that I would need to plan my nutrition intake very deliberately. One website I read from a cross-country biker said that you should feel free to consume lots of food when it's available because riding six or so hours a day for many days a week you will burn lots of calories. Of course this makes sense, and I look forward to carrying less weight as I put the miles behind me. Six weeks to go, and I've a lot of challenges in front of me, including starting to ride with my panniers fully loaded and doing a couple of two- or three-day trips so I can get used to camping. One thing I'm not sure I'll be able to train for is the solitude of being on the road. The truth is, I'm something of a loner anyway, though my daily life is steeped in interactions with folks. Perhaps because of the intensity of my work schedule, I often want nothing more than to be home alone, though Shadow, my cat, is a constant companion. Spending time alone is how we introverts recharge. Here's the rub—this trip will push me to minimalize in a serious way and simultaneously require me to be more outgoing than I usually am if I am to engage people in conversation every chance I get. My instincts will have to be sharpened and my shyness set aside. A number of people have expressed concern for my safety. Basic road safety is one thing, and any long ride reminds you that this is not like casually driving in a car. You really have to keep your eyes on the road and your peripheral vision active. My sense is that the concern they have for me is above and beyond this. People have cautioned me about riding through certain states (Idaho, Wyoming, Nebraska, Alabama, and Mississippi, to name a few), and I understand and appreciate the concern. Heck, I get the creeps driving a car through the South. It's not only memories of Jim Crow days when our family had to go to the back of the store to buy food in West Texas but much more recent trips where people can't stop staring, as if I'm an alien or something! But that's part of why I feel compelled to do this as well—to know that I can, not to prove to the world that I can but to gather the courage to find out if I can. And yet I know two things: first, I will carry a certain amount of privilege with me, and that will be signified in numerous ways, from my bike to my clothing. And to some extent this will shield me from being misread as foreign. And yet, secondly, as a man of color, I know that I cannot forget that my very body will mark me in ways that are inescapable and my safety can spin on a dime depending on whose path I cross any given moment. At the same time, as a man I carry male privilege. It may be considered risky for me to make such a trip, but it would be considered absolutely foolish for a woman to go alone. This is not to say women shouldn't have every right to do so or that many women don't take long solo trips. Early tomorrow morning I am heading out to Wisconsin with two friends to participate in the Chippewa Valley Century Ride. My friends Yectli Huerta and Gilberto Vasquez did one of these recently, but the 65 miles I rode a few weeks back was my longest ride yet. A 100-mile ride will be a new milestone for me. If successful I'll feel much better about the challenge ahead. I have trips planned for the next two weekends in a row to get a better sense of the feel of daylong rides and camping. Next weekend I'm heading out to Lake Itasca to the headwaters of the Mississippi. The week after that I'm going to Melrose, Minnesota, where Kelly O'Brien, a colleague of mine, has arranged for me to speak to townsfolk about the changing demographics of Melrose. I'm going to bike back. It's about 110 miles to Minneapolis, but as best I can tell I'll have to take an indirect route that will add a few miles. As I head into the last month of preparation, I'm accumulating supplies and equipment, refining my route, and getting ready to let go of my life as I know it for a while. I'm both anxious and excited as I hope to learn a lot on this trip—about others as well as myself. I hope I'm not disappointed. The recent debates on immigration policy have proven to be as polarizing as one might have expected. Listening to talk radio on the road I am struck by the vitriolic rhetoric of talk-show hosts and callers about all these so-called unwanted illegals. It is painful and sad to hear. So much misinformation, so much willful ignorance, so much disdain for other humans beings. I have to wonder over and over again what it would take, if it's even possible, to change people's minds and hearts. I don't understand the lack of compassion. I don't understand the blindness that people have to how they are connected to immigrant labor by the food they eat, the industries where immigrants work that help sustain the quality of life in this country. How can people not see that their well-being is linked to the well-being of others? Well, I could not keep up with my cycle mates, and somewhere around the 40-mile mark I inadvertently took a left when I should have taken a right and ended up on the 75-mile route instead of the 100. I realized my mistake a few miles down the road, but by then I had to admit that would I not be able to catch up and that I didn't think I had it in me to finish—at least not before the ride organizers called it a day. Counting an early misturn and a short postride, I logged 80 miles. The weather was very, very cool and the winds hard. It seemed like the winds were always in our faces whatever direction we were going. The organizers said it had been years since it was that cold and windy and that a larger than usual number of people were given rides back to the base site because the combination of wind and hills was just too much. I really felt my lack of stamina and strength training, but it was a good reality check. Still, all in all, it was useful for me to confront my limits, to get this many miles in, to enjoy the beautiful Wisconsin countryside, and to have some brats and beer at the end! The folks we met at the park and on the ride were all nice, though I have to say Yectli, Gilberto, and I were the only visible signs of a diverse population out there! The trip to Itasca last weekend was a chance to try out my camping gear and get another long ride in. Lisa Sass Zaragoza, my friend and colleague from work, went with me. It was a great chance to see an area of Minnesota that I'd never seen before—Paul Bunyan country, you might say. As a kid I remember reading the legend, so seeing the statues of him and Babe the blue ox was entertaining. We made camp at Cass Lake and tried out the mini-stove, set up our tents, and played cards while we fought off mosquitoes, which also gave me a chance to test my insect repellent. It started raining in the middle of the night and continued the entire next day. After a breakfast of oatmeal and coffee we set out to ride to Lake Itasca, which we both thought was only 35 miles away. Riding through a steady stream of rain wasn't that bad, and I figured it was good practice for a scenario I'm likely to encounter. I don't intend to ride through storms, but so long as visibility and maneuverability isn't compromised I'll trudge along. The only time the rain became a major factor was when we took a shortcut through a country road of unpaved limestone. This slowed us up considerably, but we made it through. About 25 miles into the ride we were looking forward to having lunch, and we saw a sign that said Itasca Park was another 20 miles away. It was more than we bargained for, and as game as she is and a much better athlete than I, Lisa hadn't planned or trained for that long of a ride. So we decided to stop in the little town of Kabokane and head back, still giving us a 60-mile ride. We took a nice break at a gas station where the owner let us rest on some chairs as we ate lunch indoors. He let us know that the rain wasn't going to let up, so after a good rest we headed back and were oh so happy to discover that the campground showers had hot water. Afterward we decided to drive to Bemidji and get a good hot meal. Later we went by Itasca and saw the headwaters of the mighty Mississippi and a beautiful rainbow. The mosquitoes were much less of a problem that night due to the rain. After breakfast the next morning we returned to Minneapolis, tired but content with a good experience. The two most important things I learned from this experience are that I have to give my meals and calorie intake lots of consideration and that I have to better find my rhythm going up and down hills using my gears more strategically. I visited a nutritionist this week, and she informed me that I need an intake of probably 6,000 calories a day—a heckuva lot! Blogs from cyclists who have traveled long distances have said as much, but thinking through that from the practical standpoint of carrying food is an important thing to get my head around. This past weekend Kelly took me up to her hometown of Melrose to introduce me to folks whom her equally gracious father had arranged for me to meet. It was an eye-opening experience and gave me the chance to try out my conversations with a wide array of people as well as to cycle 130 miles back home. Melrose, like many small towns of middle America, has undergone a dramatic demographic change in the past decade. Repeatedly I heard from folks that prior to 1996 there were only about 16 Latin@s in town, all part of the Cruz or Carbajal families. During the '90s economic boom a great many Melrose citizens took better jobs in St. Cloud and subsequently moved. It was then that Jennie-O, the turkey-processing giant, began hiring large numbers of recent immigrants, and thus the chain-migration process began that resulted in a significant population from Michoacán migrating in to take entry-level jobs at the plant. These workers were an asset to the plant, helped the local economy grow with their entrepreneurship and spending, and boosted the housing market by buying and renting homes so Melrose did not experience a hard economic downturn despite losing lots of its Anglo residents. Now, Latin@ migrants from other parts of the country and more recent arrivals to the U.S., many of whom are sin papeles, comprise more than one-fourth of the local population. My host for the day was Kelly's dad, George O'Brien, a retiree and former two-term mayor of Melrose from 1996 to 2002. It was during his tenure as mayor that the influx of Latin@ immigrants began in Melrose—and it was clear that George's leadership and open-mindedness toward Melrose's newest residents had a tremendously positive impact. In his own words, townspeople have tried to learn from the mistakes made in other Minnesota towns like Willmar and Worthington where the change in population has not been so smooth. To this end they are working with the Latin@ community and immigration advocates in the Twin Cities to develop a response plan should ICE (U.S. Immigration and Customs Enforcement) make Melrose the target of an immigration raid. More impressively, George was the catalyst for the formation of Communities Connecting Cultures (CCC), a nonprofit immigrant service organization whose single staff person, Ana Santana, works 25 percent of her weekly work hours running the organization and whose pay is supplemented by Jennie-O, her employer. The CCC has a board that offers Ana advice on issues that arise and direction for the organization's growth. George had heard about a similar organization in another town and approached Jennie-O about providing staff support and some office space to start the program locally. Ana, her husband, and their three children live in a trailer park in Albany, a town about 10 miles from Melrose. Like her, many of her co-workers live in surrounding towns and make the short commute daily. Originally from California, Ana said her father moved them to Melrose in the late '90s for better working conditions. In California her father worked in the fields, and she shared memories with me of spending days in the vicinity of the fields while her family worked. Her father has since moved to find work in the southern U.S., but with a family and a stable job, she doesn't foresee leaving Melrose. She said when she saw the position advertised she was immediately interested and felt that her English-language proficiency and interest in helping her co-workers would be an asset. Over the past few years the range of support services offered by the CCC has grown expansively, from offering basic advice to newcomers about employment, social services, and cultural events to providing free tax counseling to people in the surrounding communities. Young kids take advantage of Ana's diligence, sincere desire to help, and resourcefulness—I heard one anecdote about a young man who wanted to learn to break dance, and she was able to find some online information for him so he could teach himself. Her work with the CCC is not limited to 10 hours a week, as folks approach her at home or church with questions. The Santanas' house is decorated with Mexican Catholic religious and cultural icons. The kids gathered around as we spoke, and they were happy to pose for a picture with their mom. I asked her what her hopes and dreams were for her children, and she replied that she wanted them to have a good education so they could have even better opportunities than she has had. George: It's hard to discriminate against people who work so hard. One of the things we did when Jennie-O's said we could hire Ana Santana was put her out there. She's probably better known than the governor of Minnesota to most people around here. She's helped 390 people this year, filling out taxes, et cetera. The church has a Spanish-language mass. Barbara: This is a highly Catholic area, and the priest has been very active . . . They put in a statue of Our Lady of Guadalupe. Me: Do folks accept this? Barbara: Yes, but not everybody. Me: Where does it come from with people like you and others, this willingness to be part of positive change? Barbara: I think it's just good Christian people practicing faith. I belong to a group of ladies. There may be disagreements with the national issue of illegal immigration, but locally it's different. We are neighbors; we meet and have meals with them. Me: So actual interaction helps? Me: I don't see any local tension. George: Well, our chief of police has made a difference. He's changed, too. He's different from just two years ago. Many of us have been involved in what to do in case there was a raid by ICE. The chief of police, the mayor, and city administrators have been involved in discussion at various levels. We're trying to work with Pillsbury United. I talked to Francisco Segovia there, and they are coming up with a booklet [of what to do] before, during, and after a raid. We've met with Gloria Edin at Centro Legal. She's been really helpful. We just keep going along and deal with things as they come up. Sister Adela is the diversity coordinator for the diocese. She's met with a number of people locally and nationally to plan on how to be helpful. She's our lead person in planning for a raid. Me: Have there been issues in schools? George: Yes, we need more Spanish-speaking teachers for sure. Scott told me at a basketball game some of the students started verbally harassing the Hispanic kids from Melrose, and all of a sudden a bunch of Anglo kids from Melrose stepped up and said, "Hey, these are our friends. You mess with them you mess with us!" Scott said he was so proud of them. Cold Springs has a large Hispanic population. We were down there on a Saturday, and we saw only one Hispanic lady downtown. You come here on Saturday, and you'll see lots of Hispanics. Me: Obviously, they seem more comfortable here. With all the discussion on immigration, this is a good example of how people live in the shadows. They stay invisible if they don't feel safe. What would happen in Melrose if Hispanics weren't here? Barbara: I think they came here because Anglos wouldn't do the jobs. It's very hard, dirty, and monotonous work. They came because these companies needed the employees. Me: So what would happen if they didn't come? Barbara: They wouldn't produce as much. They have two shifts right now. George: A lot of the dairy farms have switched to machines, but manual labor is still needed. Jennie-O used to close down in December and stay closed until March. Now they're open year-round. At Jennie-O they probably have about 50 Somali workers now. They didn't have a liaison person for Hispanics until we forced the issue. We sold this to Jennie-O. Me: Where did you get the idea for Communities Connecting Cultures? George: We studied what was happening in other places like Worthington. We tried to take the best of everything we knew from other places. So we talked to Jennie-O and the city. We started with a job description. We had to file 501(c)(3) status—Kelly helped with that. We only had about 15 people in the first few months. But now we're running several hundred a month. It's about developing trust. During last tax season we had people come from Fergus Falls, which is 80 miles away. We even had someone come up from Iowa. It's the trust factor that has made a difference. Kelly later expressed her chagrin at her mom's response to why the local community is accepting of newcomers; she thought it was a bit too convenient an explanation that didn't get to a more complex social and political explanation, but I believe Mrs. O'Brien was sincere. I could hear my own mom offering the same rationale because the Catholic disposition to be charitable to others and to follow the golden rule is a simple and profound guide for living; having compassion and doing good deeds offers one a way to find personal salvation—and therein lies a framework for understanding one's self-interest but also a lens through which to see how people's well-being is tied together. After lunch I met with Tim King, the publisher of La Voz Libre , a Spanish-language newspaper published in Long Prairie, and Herman Lensing, assistant editor at the Melrose Beacon, to discuss my trip. We had a lively conversation about other literary sojourns taken across the country and in other nations by foot, car, and train. Tim indicated that he would cover my trip from time to time so the local communities could stay apprised of my progress. This was followed by an opportunity to meet with Angel Vargas, a young entrepreneur who owns two stores in Melrose and one in Long Prairie. Two of these are clothing stores that specialize in ropa mexicana, and the other one is a small automotive accessory store in downtown Melrose that specializes in electronics. While the clothing stores target the Latin@ community, Angel spoke of wanting to draw a more diverse crowd to the accessory store. Angel is from Fresno, California, and came to Melrose with his family about five years ago. Besides being a young entrepreneur, he is active in the community as the director of one of the youth soccer leagues. He and Tim King spoke about the prospect of buying one of the local radio stations and wondered aloud if advertisers would support a Spanish-language station. After chatting with them I met with John Jensen, the chief of police, at a coffee shop across the street and had a very insightful conversation on his perspective of Anglo-Mexican relationships in the town. Kelly took me on a brief tour of downtown Melrose that included a visit to St. Mary's Church—where a Spanish-language mass is held on Sundays and a side altar has been set up to honor the Virgen de Guadalupe—and a quick trip to Earl's Bar. Kelly took me to the soccer game at the park to meet Peggy and John Stokman, retirees who relocated to Melrose from Nebraska with the intention of finding a community where they could be advocates for new immigrants. As with the O'Briens, it was evident that the Stokmans were known and liked in the community as children and adults went out of their way to greet them. Having spent some time in Central America on a mission, the Stokmans returned to Nebraska and became involved in the immigrant-rights movement, mostly through their church. Though their involvement is something that is frowned upon by their children, who take a more legalistic approach to people's rights, they have not allowed that to abate their passion for their work. Aware of how their presence as outsiders might be perceived, the Stokmans' entree into the Latin@ community of Melrose began through their regular attendance of the Spanish-language mass. After a few weeks some parishioners began approaching them, letting them know they appreciated the couple's presence, and inviting them to social outings. As trust was built and genuine relationships formed, the Stokmans said residents told them what they needed most was English language instruction. Having experience with this in Nebraska, they put together a free ESL (English as a Second Language) program and solicited volunteers from among Melrose residents who served as instructors after receiving some training. This program involved more than 60 tutors, most of whom knew no Spanish! Notwithstanding the impressive involvement of residents in the ESL program, when I asked them about Anglo-Mexican relations, they admitted that for many folks, particularly the elderly, there was reluctance to accept change. Scattered throughout the mostly Latin@ crowd at the park were some young white youths who were clearly friends of the players. To help me get an answer to how youths were adapting to this change, the Stokmans took me to a high school graduation party to which they had been invited so I could find out for myself. There I met the guest of honor, Elena Cruz, who aspired to go to St. Benedict College in St. Joseph. In her view, socializing among youths of different backgrounds in the high school was somewhat limited. However, her younger brother, who just passed to the sixth grade, said the kids were all friends despite their backgrounds. I also had the pleasure of meeting Mr. and Mrs. Carbajal, some of the longtime mexicano residents of Melrose who are considered community elders and often looked to for advice. Mr. Carbajal is now retired from Jennie-O, while his wife continues to work in human resources at the plant. Mr. Carbajal was fairly adamant that things have changed for the better for the Latin@ community as it has grown. He said it is incumbent for new immigrants to earn the trust of locals through their actions and behavior. I left Melrose about 5 p.m. feeling very satisfied with the range of people I met and the conversations we had. My goal was to reach Watkins, about 45 miles away, by nightfall. When I got there, I could not find a place to camp or a hotel, so I rode into the dark to the next town, about 16 miles up the road. Highway 55 has a nice, broad shoulder, and though there was no moon out and I had to ride a lot more slowly, I made it to Annandale a little before 11 p.m. Unfortunately, I ended up having to go two towns farther, to Buffalo, before I could find lodging. By the time I arrived it was close to 1 a.m., and I had gone 85 miles. Very, very tired, I slept late and rode the final 45 miles home the next morning. The next weekend, Yectli and I rode the Willard Munger Trail from Hinckley to outside of Duluth and back. I rode 120 miles in a single day for the first time and declared myself ready to go—physically, at least. News from Capitol Hill. The immigration reform bill is dead, and the Supreme Court shows its colors by dismantling desegregation efforts in the K–12 system. 'Tis a sad day when our legislators show once again that they are unable to take action on one of the most pressing issues facing the nation. Is it 2007 or 1967? At least in 1965 and again in 1986 the nation's leaders were able to pass legislation that accounted for the world we lived in. Our leaders today are moving us backward by failing to figure out how to move us forward. And I'm starting my trip. I spend Monday and Tuesday leading a seminar on immigration called American Crossings at the Minnesota Humanities Center for a group of 50 impassioned educators who know that education is the key to our future, as is the need to find a just and fair solution to our immigration policies. The goodwill and sentiments from many who have expressed concern for my safety inspire me and lighten my load as I pack to leave for Santa Cruz, where my longtime friend Marianne Bueno, a PhD student in history at University of California–Santa Cruz, will host me as I make final preparations for hitting the road.